Market has been coiling for the past few days between 2710 and 2730 and for that matter, between SPX 2650 and 2780 in the past month. It's forming a wedge in the 5 yr weekly, indicative of a break out in either direction. Current plan is to just sit back, relax and watch what unfolds and let market market make its move. What's more likely, market will probably take longer to decide and the small position will expire. In the meantime, will continue to focus on savings and monitor valuations of selected companies. So the market went up. SPX is approaching key 2800 level and it will be interesting to see whether it can surpass the level and keep it. If it does, then we will probably make new highs, possibly to 3100 or so. Which caused the market move up as economy appears to be doing well without full employment and market expectation of fast fed rake hike eased. But things are not that simple, as there are many mixed signals. This is good and bad, indicating that there is room for more upside to stocks but it also means economy is heating up. 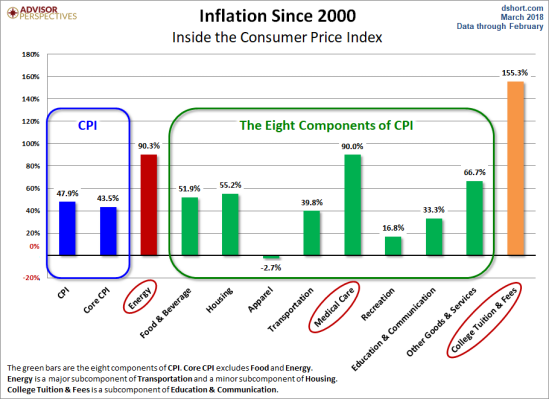 We'll be getting the dreaded CPI next Tue (3/13) which caused the correction in the first place. Then we get PPI after that on Wed (3/14). The problem is, it's not what the market expects, but what the fed expects. Then there's Trump. The Trump deficit (tax cut), Trump tariff and in the works Trump-Russian scandal amongst other Trump scandals of more personal nature. And we can add Trump-NK here as a possible fallback. A sure winner, but not much gain is to play the rising rate in the form of a cd ladder in 3,6,9,12 mo. increments. 6 month CD is like 1.8% now (3.6% per yr), and if I just wait a week, chances are, cd rates will be higher. Not really exciting, it's chump change but it is FDIC insured and it's cash. By combining CD ladder with existing, I can average around 4-5%. ** 6 month T-Bill is yielding a bit higher than CD's currently. -- 09/13/2018 -- -- -- 1.870 Yes -- 03/15/2018 CP SFP -- 6 Mo. Therefore, my plan is to do both. With profit reserve from last year, I will take the market risk. With bulk of my net worth, I will take the CD ladder at 4% for even money. The goal will be to preserve and save. In the mean time, I will be monitoring the companies to buy on the down turn. Been really busy at work and haven't been able to pay much attention to the market lately. I've been keeping an eye on the small short position, which will expire by the end of the month. Market is still undecided at this time but given current conditions, I expect more than a fair chance that market will retest February lows. And Trump, who is exhibiting signs of emotional instability and megalomaniac tendancies, has been very helpful in killing the market. He seems to think that he owns America and he can do whatever he pleases but that will be a grave mistake on his part. I believe his continued antics will increase the chances of market downturn. On a brighter note, had a chance to participate in the national school walkout and observe the upcoming generation en mass. What really struck me was that these kids were genuine, truly cared and showed signs of maturity. They are a much better bunch than the Millennials and I have high hopes for this upcoming generation. 3. NEVER invest near market highs as it will take a long time to break even, especially when factoring in inflation. 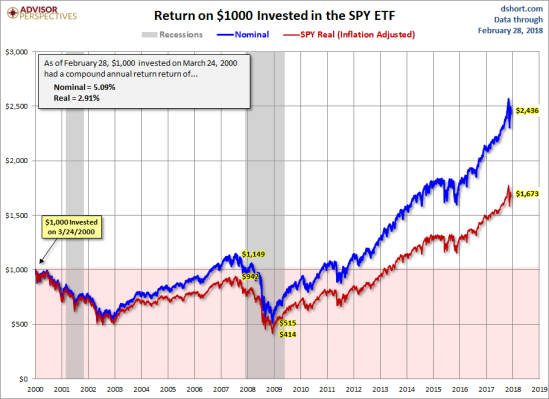 This is a chart of $1000 invested on SPY (S&P500 ETF) at the peak of the market bubble in 2000, and its performance to 2018. * It took about 6.5 years to get the $1000 back, but because of time-value of money, the $1000 after 6.5 years was maybe only worth $900, a loss. * Factoring in time-value of money, it took about 13 years to break-even in real terms, after adjusting for inflation. * It would have returned about 5% compounded annual return to 2018, which does not factor in time-value of money. This is a very ***scary*** fact, considering that 5% was the best it could do during the largest monetary expansion in the history of the United States IN CONJUNCTION with zero interest rate policy for almost a decade, ***where most of its growth took place***. When factoring in time-value of money, the 5% return drops to 2.91%. The fundamental question underlying your statements is how do you know you'll be able to call the top? Hindsight is 20/20. You don't have to call the top---you just have to have been in it. If you FIREd in January 2000, you were essentially in it. Your inflation adjusted return between then and now (18 years+) would have been 2.91%. Your SWR better have been less than that or you'd be feeling the squeeze by now... and should be looking for work. The 2.91% would be one Monte Carlo outcome when people do these calculations 50 years from now; but the person who FIRE'd in 2000 is actually living it. As one's speeding toward the cliff, I don't think it's necessary to calculate the exact moment to bail out of the car to avoid falling over with it. So long as you get out of the car before it falls over, you're golden. You can decide what items are okay to leave behind and what items are not. As they say, there is more than one way to skin a cat. But to answer your question, you look at it from the perspective of top down. No one can accurately predict the future in terms of the economy. And we can formulate an outlook based on some things that we can understand and create a prediction moving forward. I guess if one's been through enough of these, you get the feel for it after a while. 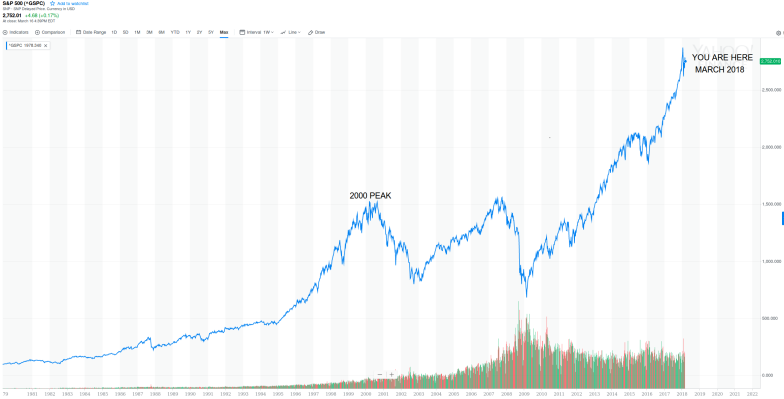 I had a pleasure of going through the black Monday in 1987, the Dot-com crash 2000, Financial Crisis 2008 and now the bubble of all bubbles that we face here in 2018/2019/2020 or whenever. I think everyone pretty much knows this already. Fed is wielding the sword. Still holding on to the small short position, which is currently in the money. Will wait for Fed's action tomorrow. Market could move higher based on perception of Fed's stance. Search for yield continues. 6 Mo. treasuries seems to be around 1.9% right now. Current goal is to achieve at least 2% or higher yield in treasuries or fdic insured, for an averaged return of around 4 - 4.5% combined with existing port at 6% fixed, for even money. I use 5% for inflation (though it's probably closer to 6%) and 5 years is probably a good resonable window for the upcoming market correction. It's a huge bubble, the biggest we've faced yet. The estimation is give or take 2 years to start and 3 years for the sell off. Looking back, the blessing was starting this journey in 2013. For most mortals, the best way to save money **in real terms** in the past two decades was to reduce spending and adjust to a more frugal lifestyle. Employers only paid wages that offset inflation and not much more. It makes sense why so many live paycheck to paycheck, in more debt. The raises were an illusion. Many probably believed they could afford to live a better life to their detriment. I was clearly a late starter, but better late than never. Since starting ERE, it took about 5 years to double the net worth, a 14% return. This was achieved almost entirely through lifestyle reduction and savings. While the wages did not increase wealth, the market did. Fed's relentless pursuit of easy credit by "printing money" was the dominant factor. This appears to be ending as Fed seems to be signaling balance sheet reduction or credit tightening. History as a guide, market will likely falter. If Fed can achieve soft landing (i.e. 10 - 20% correction) that will be commendable. The first step was to save and have cash to invest. It took 5 years (and it will continue) but some options are available now after commitment and hard work. The second step will be to invest when the time is right. They say a person gets maybe once or twice in a lifetime chance for a golden opportunity to invest. I've already had two (2000, 2008) but I didn't have any money nor the awareness. I wasn't prepared. I am hoping third time's the charm. Took a decent profit on the small short position. It's almost market close and I expect a small bounce before market resumes downward to retest February lows. I will be watching for the bounce and will wait to re-enter if market resumes downward. On the sidelines for now. Good luck! It tends to favor the prepared. In 2000, I had neither money nor awareness ("what is the stock market good for anyway?"). In 2008 I had both which was very helpful. I'd also add 2013 although that was just a tiny blip. Recently, I've been accumulating dry powder in a 3-4 month CD ladder (FDIC insured). 2% would be nice, but 1.5% is good enough for me compared to the fact that the generic SPU doesn't yield much more. The 3-4 months is a compromise between having a barbell (CD + equity) in the face of hikes and being able to unroll it fast enough and load it into what gets hit hardest when the big one appears. I think it'll be faster than 3 years. I figure having it in a ladder will instill some discipline to avoid getting carried away with any "buy the dip! buy the dip! "-traps which were plentiful in 2007-09. 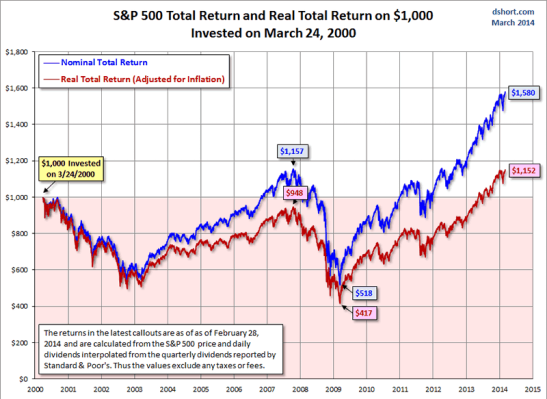 Curious, in the 2008 experience, did you select the whole market in the rebound or did you cherry pick? I'm concerned at the debt level in the US as we will soon be faced with 30-50 trillion dollars in a decade or so depending on how this plays out. For the short term, let's say buy the dip. I have wonder, what will we be getting for the long term? Not exactly the kind of Christmas present everyone hopes for, is it? Coming out in 2009, I was mostly in small cap. They tend to do better coming out (because they got hammered going in). More importantly, right now there's practically nothing to be found at decent values. If/when CAPE10 is around 15, there'll be lots more to choose from and small/mid caps will tend to have the more attractive valuations. I dunno going forward. I'm given a lot of though to a barbell strategy with 95% in cash and broad market call options(*) for the rest. I suspect more volatility and higher interest rates ahead. However, all cash is risky with inflation. So I don't know. (*) To capture some of the FAANG insanity. Generation-X, thank you for keeping an incredibly lucid journal. Your posts seem limited to here....they are missed in other areas in the forum. I admire your adherence to fundamentals, taking note of the overvaluations on your very first page back in 2014, and stubbornly resisting the FOMO. No doubt your experiences in the dot-com bust informs your mindset. You speak a lot about evil and insidious inflation. George already tried to get you thinking about a rental property...I understand that either you want to be a landlord or you don’t. You also mentioned precious metals once in your journal. I’ve read in some places that gold is a bubble and will drop 50%. I’ve also read that gold will do well if we have a huge debt bomb implosion that requires a huge increase in the money supply. It would seem to me there is a lot more upside than downside there. But you are extremely rigorous in your thinking...is there something you know that I don’t? You also mentioned a 6% debt instrument that your utilize. Is this unique to your pension? I’m jealous! Also, if 6% is the rate that actuaries give out, where is that figure coming from? Just curious, not because I’m asking to get in on it (even though I want to get in on it) but because I’m trying to understand better how things work. If I know so-and-so is willing to pay 6% when 30 year bonds are barely paying 3%, it could illuminate some of the “how” and “why.” Or were your 6% debt instruments a legacy from when bond yields were higher? I love your charts that show the real return of investments after inflation, it’s just hard to know for sure what real inflation is. There is so much conflicting information. Also, are you doing your options trading inside or outside your pre-tax or Roth accounts? On the one hand, if options expire worthless inside a pre-tax account, it’s that much less money you have to pay taxes on later. On the other hand, I wouldn’t want to have to pay income taxes if my options made huge gains. I would love to hear how you manage taxes in that regard. Thanks again for the journal, and remaining true to your analyses. Expect market to continue its path tomorrow and will be on the look out to see if it falters. This will be an important test for SPX, as if it reverses before 2750 or so, then the next retest at SPX 2600 could be the real thing. Lol, thanks for an awesome clip. I can just see a 30-second Superbowl TV spot - Aesop's Value Fund, Slow but steady, wins the race! 1. a **trade** instrument, providing a temporary safe haven during times of market downturn and periods of published large inflation on record. 2. a commodity, for luxury and in electronics. During 2008 Iceland financial crisis, the country of Iceland practically defaulted. Its stock market lost over 90% of its value, its currency declined more than 60%, inflation ran up to 18.6% and interest rate ran upto 18%. Of course, there were investors in Iceland as well, and many held physical gold and/or gold instruments because they knew this was coming. So how did gold do? I remember there were forum dicussions and real time chats with these guys in Iceland at the time and amazingly, they observed gold being traded at "normal" prices during the collapse within Iceland. Iceland had imposed capital controls. So my opinion of gold is that it's a trade instrument, a commodity and NOT some magical hole card that will cure a financial collapse. With regards to options, many people use IRA account to simplify taxes - it eliminates it. And IRA requires a higher option trading level than 401k. Most brokerages will require options trading experience to trade options in an IRA. Well, if you are in Iceland, it would seem that the only thing that HAS retained its value, is gold. If you can’t get the right value for gold in Iceland as a result of capital controls, and everything else is in the toilet, it would seem to me that your best option would be to just pack up your gold, and leave Iceland. Do you suspect that gold will return to its previous range of $200-300? Or it’s $35 price tag at the window when Bretton Woods ended? Trillions of dollars of increasing sovereign debt, shrinking growth....shouldn’t the currency suffer? Even if the real return of gold in the long term is 0%, that’s better than the post-gold standard dollar. Your journal is rife with skepticism of the government. “Highway robbery all over again.” Isn’t that what seigniorage is? Rack up debt, debase the currency, pay off the debts with said debased currency. Savers in fiat foot the bill. In Ancient Rome, the Aureus was debased, then replaced with the Solidus, which was also debased. They taxed the locals in precious metals, and distributed new currency in base metals. Sign of declining empire. Isn’t this what is happening? I don’t mean to hammer you. It’s just that I share all your skepticism of the current market and have come to the opposite conclusion (for now). Gold isn’t a magic cure, just a stable store of wealth protected from short-term market busts. I would hate to be all in fiat if the next bust requires QE4. You’ve worked too hard- I hate to see your reserves be eroded. Even a small allocation could make a huge difference for you. Regarding options, the consensus suggestion of reading material has been Natenberg. Do you read that or anything else, or did you just learn by doing? The question about gold is interesting and it's an age-old question - what is the best medium of storage of your economic contribution? Fiat loses significant value over time. It's a lossy storage medium. That's why we are *forced* to invest or forced to produce more (work) to keep up with the loss. But in a situation similar to Iceland, a financial crisis caused by a default, I would prefer to own real wealth over anything else. Movement of money during a crisis will be difficult, even now***. If the day comes when US government defaults on its debt, imho, that will be the day when the house of cards crumble. The worry over massive federal debt is exactly that - even reserve currency has limits. On books, another popular book is McMilllan on options as a basic starting reference. CBOE is also good intro source. More math and in depth - Euan Sinclair, etc. ***While there no legal maximum in taking cash out of the US while traveling, amount over $10,000 must be reported to Customs and Border Protection. If not, the cash will be seized until proof of the legitimate source of the money and proof of the legitimate intended use of the money are provided. So if this was a situation like financial crisis, chances are government will limit the amount of currency/exchange in travel, just as it happened to Iceland. Even if you were able to bypass customs, ever since Foreign Account Tax Compliance Act (FATCA), many foreign banks will NOT allow a US citizen to open a foreign bank account. So the next best thing then, is to renounce US citizenship and live in another country. I have no intentions of leaving the US. If the US collapses, all bets are off, and as bad as it could get here, I am sure it would be worse elsewhere. I don’t think the US government will default outright. They just devalue and pay debts with the devalued currency. This already happened in the 1970’s and again after 2008. Given the debts and trade deficits, I can’t see why this shouldn’t happen every 10-20 years in a floating fiat world. I could easily see the $500k you are holding today be worth $200k in today’s money, 10 years from now. You are right, it’s best to have possession of things that are *real*. Thanks for the tips! And good luck with the Aesop Value Fund. That is correct, until US defaults on its debt, gold will remain a trading instrument. It is a quasi reserve currency. Inflating our way out of debt isn't something new. But we are not going back to 21.46%, let alone 5% interest rate anytime soon, because the Fed can't afford it. We are entering a period of monetary contraction. The Fed isn't going to lose money. The tail risk is that there *is* a chance US could default as a result of a catastrophic downturn should it occur. As pointed out earlier, the capital controls are already in place. But we will be able to see it coming and there will be a window to convert fiat if you know what to look for. Until then, US will remain dollar denominated. The total American household net worth is about 100 trillion. I guess we'll find out in 10 years if our net worth drops to 40 trillion, if you are correct. There is real wealth in the United States. It isn't the gold or the silver or even the dollar. It's in plain view. But more importantly, it's in the system, the people and the grey matter that occupy the space between the ears. The wealth will last if there is a will to keep both the system and people honest and truthful. Good luck in gld options. Volatility is nice but try not to drive looking through a rear view mirror. ***Pretty much in a nutshell, the crux of Keynesian economics is that by controlling the relationship between available goods and the quantity of medium of exchange/storage chasing after these goods (i.e. 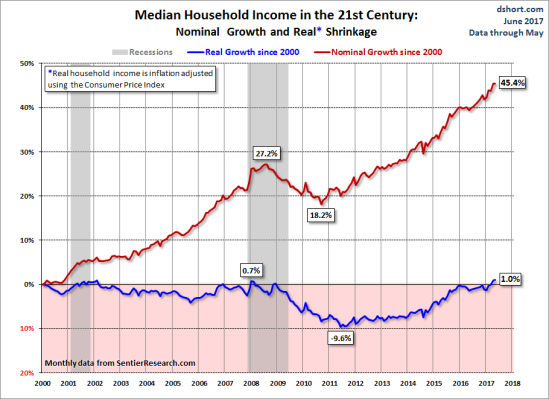 fed target inflation rate of 2-2.5%) it produces real wealth. Because people have to have more and more green paper to buy the same item year after year (i.e. a big mac) they have to be more productive (work) to get more green paper, which in turn produces more goods or real wealth. And the reserve currency status prolongs this effect by distributing the local currency world wide which are then held outside. This dilution allows for more fiat printing capacity in reserve currency than in non-reserve.